When TheStreet attended the Autonomous Vehicles conference in Detroit in August 2018, one of the more interesting topics came from a panel discussion involving the autonomous trucking industry. Put simply, industry leaders believe that autonomous trucking solutions are roughly three to four years away from hitting the road. That doesn't mean that we are going to have driverless semi trucks cruising all over the country, but rather, select U.S. routes taking advantage of semi-autonomous or fully autonomous driving capabilities. The autonomous semi truck story usually takes backseat to stories like Tesla's (TSLA - Get Report) Autopilot or Alphabet's (GOOGL - Get Report) (GOOG - Get Report) recent strides with Waymo. But the segment is gaining some revival this week after Daimler (DDAIF (the parent company of Mercedes-Benz) unveiled some new information about its self-driving trucking business at the Consumer Electronics Show in Las Vegas. At the CES show, Daimler unveiled that its new Freightliner Cascadia semi truck will come with level 2 self-driving capability. That doesn't mean it will be able to drive itself - which would require level 4 capability along geofenced routes or areas - but it's still a notable advance compared to what's presently available. 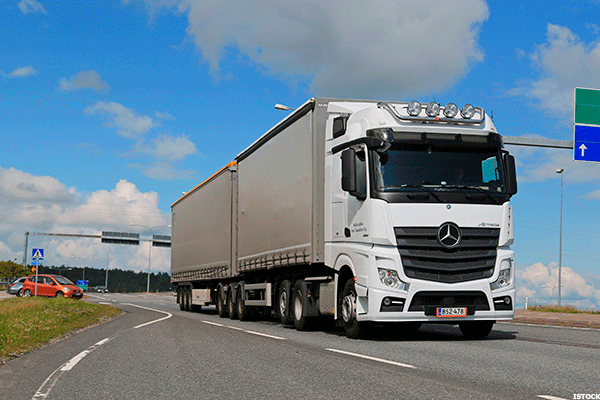 Daimler plans to build the trucks in the U.S. in July and it could hit the road by the end of the year. It will be the first level 2 production truck in North America. The automaker also plans to hire roughly 200 employees to work on autonomous trucking solutions. Level 2 capabilities will allow Daimler to build on features such as adaptive cruise control, blind spot awareness, emergency braking and self-driving lane-keeping features, among others. Not only will these solutions improve the safety of truck drivers and those who share the road with them, but it can make transportation more efficient. Eventually, it should also help relieve some of the driver-shortage issues that logistics companies currently face. Alphabet is a holdings in Jim Cramer's Action Alerts PLUS member club. Want to be alerted before Jim Cramer buys or sells GOOGL? Learn more now. For those wondering what Mercedes/Daimler is doing making trucks, the company does more than spit out C-Class sedans and Maybachs. In fact, Daimler is routinely one of the largest big-rig manufacturers in the world each year, as was the case in 2017. The world's largest semi truck manufacturer making a stronger push into autonomous driving solutions is a positive step in the right direction. That doesn't mean it won't have competition, though. There's the Tesla Semi that will undoubtedly come packed with the company's Autopilot features. Also remember that Waymo is working on migrating its self-driving platform to semi trucks as well. Daimler says that it plans to bring level 4 driving capabilities to the road in the next decade. Interestingly, though, the company says it plans to skip level 3 features and the platooning concept, moving right from level 2 to level 4 as it works on perfecting its driving capabilities. Daimler Trucks and Buses CEO Martin Daum said at CES, "It needs to be reliable and safe and work in all conditions, rain, snow and constructions sites." Of course, Daimler will hit level 3 capabilities as it works from level 2 to level 4 - it's the natural progression. But the truck manufacturer appears that it will forgo making it a standalone capability for its trucks as part of a separate release. The lack of platooning is surprising - where one or several driverless semi trucks closely follow a lead human driver - given that many companies are keying in on this technology. Either way, the movement toward autonomous semi trucks is happening and the largest manufacturer is now moving in that direction. What components the company will use to power its autonomous trucking ambitions is currently unknown. However, Daimler/Mercedes is currently working with Nvidia (NVDA - Get Report) on autonomous taxi solutions, as well as other various A.I. functions, so seeing Nvidia power Daimler's self-driving truck ambitions would come as little surprise.